Legio Fidelis - Forever Faithful! Forums » Guilds » Neutral Guilds » Legio Fidelis - Forever Faithful! Decentius surveyed the battlefield, the foul scent of burning flesh filling his nostrils with each breath of tainted air he took. Tattered banners of the three alliances hung high, caught by the wind and flapping like a body from the gallows; lifeless and broken. Only the heraldry of the Legion hung tall. He closed his eyes, and was immediately brought back to his younger days. The days of following Varen Aquilarios through the forests of Valenwood; traversing the difficult landscape north. And then from Bruma, fighting through to the very heartland of his home, into the Imperial City, where Varen, Duke of Chorrol slew Leoric the Reachman, bringing about an end to the short-lived worship of Daedra throughout the Empire’s lands and ascending himself to the role of Emperor. It was a joyous day, a time for celebration. A time of victory. And now… this. Snapped back to the present, Decentius turned his gaze from scorched, marred corpses; burnt beyond recognition, and focused on the tall, shrouded men and women that gathered around a small cart. Aquilarios was gone. And with his disappearance, the Daedra came alongside their cultists, their worshippers. The blackened robes resisted the wind, the foul cultists muttering words in that disgusting tongue. Soon, the lifeless Imperial corpses in the back of the cart twisted to life, wrenched back from the welcoming arms of Arkay’s embrace to fight once more. That was it. The final straw. He could not stand to see his people; his brothers and sisters in arms that had died so bravely, so valiantly, turned into these aberrations. These mindless undead beasts. He knew what he must do. And so he joined the many Imperials that had deserted, disillusioned with the vile necromantic magics employed by the desperate command staff. Legio Fidelis (The Faithful Legion) is based around a collection of Imperial-loyalists that have disillusioned with the current ways of the Empire and have deserted. 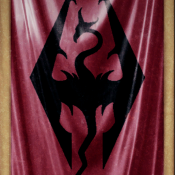 They are now seeking to return a true, Dragonborn Emperor to the Ruby Throne and to see the Empire and her holdings returned to its former glory. 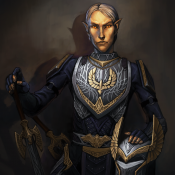 As such, the affiliation of the Legion is somewhat neutral; focusing currently on fighting the Daedra that roam the streets of their beloved Imperial City and Cyrodiil, uniting with the other loyalist legions with the same goals. The guild itself plays the part of a Century within Legio Fidelis, which opens up a world of opportunity for other Legionary Cohorts and the likes to work alongside is in dungeon-master styled events. We are a dedicated team of storytelling and military enthusiasts that wish to bring the experience of an Imperial Legionary to life as well as we can, to make it seem like you did indeed enlist and are now a member of the Legion. Whether that be through grand campaigns, locational and one-off adventures, or merely sitting back to relax with your comrades in the brief moments of respite you get. We aim to provide quality, lore-friendly and immersive content for those looking for a militaristic Imperial side to Elder Scrolls RP. Be warned; your character will be shouted at, berated and occasionally flogged to turn them into a fearsome weapon that any Emperor would be proud of. You have been cautioned! We set ourselves to the highest standard and would like you to be a part of it. What can Legio Fidelis offer you? - Quality Roleplay: The founding members of Legio Fidelis have years of experience with roleplay, storytelling and hosting events, and we're looking forward to the chance to welcome others to join us on our journey through the Elder Scrolls' expansive lore. - Dynamic, Responsive Events; you, the player, knows your character better than anyone. Events are tailored to be specifically flexible to players so that there is freedom of choice. Actions have consequences, and a split-second decision made in the heat of battle can be all that stands between death and glory. This also allows events to adjust based on member-turnout, meaning that events won't be cancelled even if just two members turn up instead of ten. - An Immersive Military Experience: We pride ourselves on being able to accurately portray and make the guild feel like a real experience in the Imperial Legions. We're more than happy to take on the roles of NPCs for events. Inspiration is drawn from all eras (Roman specifically) of military history and from other games such as Warhammer 40k’s Imperial Guard (Astra Militarum) to provide an interesting and evolving modus operandi. - Mature Themes: As a footnote to the above point, members should expect to face difficult decisions. Your character will be faced with hard choices, and scenarios such as duty over conscience, the horrors of war, violence, daedra, and all kinds of foul, insidious beings. This is not for the feint of heart. - Character Progression: In this guild, there will always be room for your character to progress, whether through the ranks to one day lead themselves, or whether it's to specialise as one of the many useful roles on which the Legion is built. We in Legio Fidelis are seeking like-minded and active players in our goal of becoming an immersive, imperial military guild! We want members who are as excited and passionate about military RP as we are; however it’s not all serious business at the end of the day. We’re a light hearted bunch and we want that to reflect in our members; so a laugh and a joke are always welcome in either our guild chat or Discord channel. We want to foster this community and become a group of tight-knit friends who can have fun without each other without the need for unnecessary drama. On the same train of thought as the previous statement; we do not want drama seekers or mary-sue-esque characters who like to make it all about them. We pride ourselves on our down to earth, everyday men and women seeing and doing extraordinary things. You will not find a grand-master swordsman who can parry every blow or a barbarian brute who can lift a boulder with a single finger here! Questions we think you’ll have! As stated in the opening statement, in-game we represent but a small piece of a much larger whole; a single cog in the machine so to speak; we represent the 3rd Century of the 1st Cohort of the Legion and operate as such. That coupled with the fact the name itself evokes a sense of forgotten pride and serves as a reminder that we are the ever faithful to the Ruby Throne and the ideals it holds. The main way is to see for yourself! We plan to host a number of public events in the future; yet if you can’t be bothered to wait, here’s a brief summary of how we do things! “Our events revolve very much around the player character, giving them choice and paths to choose when getting involved; whether it be helping an NPC and getting betrayed down the line because of it, or simply cheating when enjoying a game of dice with the rest of their comrades! One day we could be ambushing a supply convoy, the next planning an assault on a heavily defended enemy position; complete with siege warfare, or even delving into a Daedra ridden lair complete with skulls! We plan both long and short scale storylines (or campaigns) as well as off the cuff, single day events with a more laid back atmosphere. We very much feel strongly that rolls discourage players from doing what their character could or would do; and as such, we focus very much on a reactionary style of DMing. Did a member just kill a leading NPC? Fine by us! Yet expect there to be consequences later down the line! If you do have a question of your own; We’d be happy to answer either on this thread or in-game! I’m in! How do I enlist?! Joining us is very simple, and we’re really quite flexible as to how you’re able to join us. You can contact one of our recruitment officers in-game via whisper, mail, or you can simply leave us your contact details here and we’ll approach you. As of today we're steadily growing, we've doubled our roster since we first started! ...We're now at a grand total of four members. It may be a small number but it can only get bigger! Enlist today and fight to restore peace to the Empire and to Tamriel! Today, the newest recruits of the 1st Cohort, 3rd Century were inducted into the Legion fully; granted the rank of Legionary and issued with their uniforms. Pictured, from right to left: Legionary Lentulus, Legionary Temperum, Legionary Carillius, Optio Vorenus, and Centurion Lovidicus. Recruitment remains open as we enter our first phase of training. Tomorrow, our Legionaries gain their swords. We're particularly looking for members of the medical staff in preparation of this. Sundas, 14th day of Second Seed, 2E 585. CORPSES BURNT AS PER REVISED IMPERIAL DOGMA. We formed up in the war camp, and Optio Vorenus conducted a brief inspection of Legionary Temperum and Legionary Lentulus. Legionary Temperum’s armour was found to be somewhat dirty and scuffed, particularly around the boots. For neglecting to clean his armour thoroughly enough, the Legionary has been disciplined and gifted extra latrine-cleaning duties in addition to his regular obligations. Let the Statorum know. 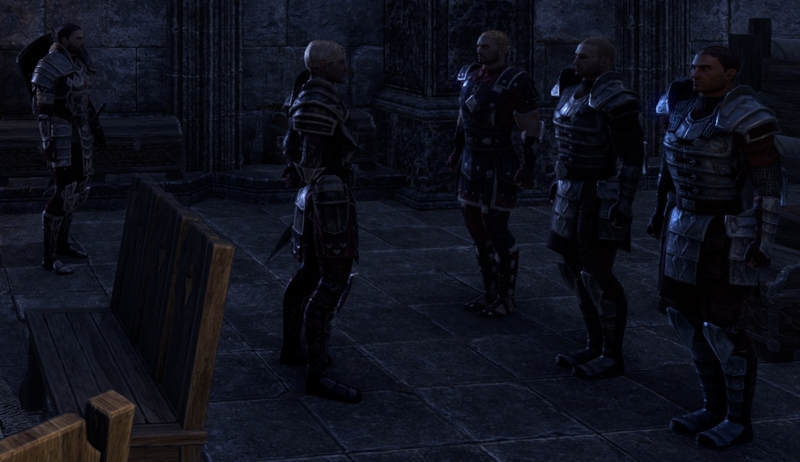 The Decury were informed of the objectives; to patrol the route near the Ayleid Ruins at Halcyon Lake. The march towards the lake was uneventful. As the ruins near the lake came into sight, so did Reachmen vines; ones that had not been there the day prior, as Legionary Temperum pointed out. We begun to advance towards it, turning a corner in the road that climbed up the hill to find a four-man Breton patrol that had been killed. Following a quick inspection, it was identified that they had been killed recently, and a large vine awoke from its previously dormant state, lashing out and striking hard against Legionary Temperum before the remainder of us were able to destroy it. Following this, a group of Reachmen ambush us. There were eight in total, four with crude melee weapons, and a further four arches on a rise behind them. We were at a tactical disadvantage due to the landscape, with the four Reachmen charging down-hill towards us. I gave the order, and the men rapidly organised into a firm shield-wall, upon which the charging Reachmen soon found themselves broken. Following the deaths of their comrades, the enraged Reachmen archers begun to fire at us. Fortunately, crude arrows proved no match for strong, Imperial oak, and we were able to advance steadily under fire. We then crested the rise on which they stood, some of the archers turned tail and fled before us. Those that didn’t shortly met the same fate that had befallen their comrades. As we continued our approach towards the Silalesi Ayleid Ruins, a larger vine was visible in the centre of the ruins. We made towards this, still advancing in an unbroken shield-wall. We next passed through the outermost entrance to the ruins, we were ambushed by two Briarhearts. They, too, were vanquished without further casualty. Optio Vorenus and Legionary Temperum secured the perimeter whilst Legionary Lentulus and I dispatched the remaining large vine. With the ruins secured, I gave the order for the corpses to be collected into a large pile and burned, as per the revised dogma of the Legionary’s General Handbook, all corpses were burned to prevent any potential necromancy. Please find attached information from the Quartermaster, regarding recovered equipment from the Breton patrol.